OUTLAW - The Renegade of Gain. Outlaw is an audio plugin effect that can be used to mix live sound, to smooth out your bass lines, synths, pads, and vocals. This gain riding tool can even be applied to problematic audio with a low rumble or hi-hat bleed. With a quick shot fired by the Outlaw, you’ll instantly hear dreary and dull sounds become animated with every essence of their true nature. Outlaw is the newest addition to a long line of plugins from W. A. Production that produce real professional results without the hassle of complicated settings. Outlaw works by listening to the incoming audio signal and compensating for volume changes by mimicking that “real touch” feeling of a consoles fader movements done by an engineer. With smooth gain leveling, you won't have to worry about drawing automation clips to tame that wild volume bandit. The attack and release option can round up a rowdy pack of transients. Keep an eye on the progress of the Outlaw with a visually stunning large display that shows the Peak and RMS volume for both the left and the right channel, while showing how much gain is riding in the center. Once you use the Outlaw, you will wonder how you ever survived without it. Pick up the Outlaw Mega Pack by W. A. Production and experience our philosophy. All Gain. No Pain with Outlaw. To celebrate the release of our latest plugin rather than include a couple of audio sample packs to give ya something new to test out the Outlaw, we went a little overboard. You may want to make some room because this bundle is massive. Let's take a look at what comes with the Outlaw. Don't be fooled by the simplistic interface. Think of the one knob as the famous "red button". 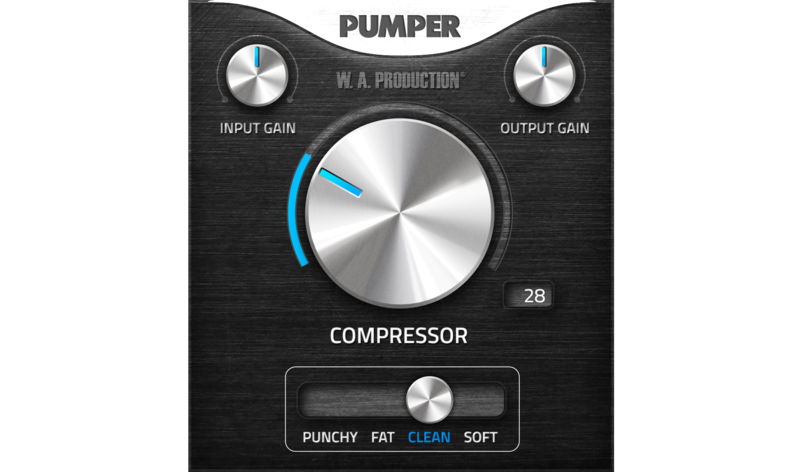 When turned, this knob has the power to give you a punchy style of compression to make those drums hit harder, phatter, cleaner, and clear without over compressing. Transient shaping has become an important aspect of mixing audio. Apply the Helper plugin and shape drums so they cut through the mix without compromising the dynamics. Cut off unwanted frequencies with a low and high pass filter and process 5 different kinds of audio signals from the audio source itself, the mid, the side, the left or the right. This is expansive and diverse pack is perfect for Future House, Future Bounce, Deep House and more. This pack delivers deep and profound bass lines, drum loops that punch, sub bass as well as minimalistic. Snares that pop, snap, and sound as if they are in the same room. Both male and female vocals samples. Beautiful harmonies and audible lyrics that sounds even better than today's radio top 10 artists. What About: House Revolution an amazing sample pack made by W. A. Production created for all the EDM & House freaks out there! Inspired by the hottest Hexagon and Spinnin producers & tunes. In this pack, you will find 6 construction kits + 5 FL Studio templates and hundreds of unique sounds all compiled into one huge 3.73 GB library. Angry Parrots Lo-Fi Hip-Hop 2 pack was developed for producers that demand perfection and music that speaks from the soul. These are the sounds of complete audio euphoria waiting for you to sculpt into a conceptual auditory work of art. Created to show producers, such as yourself, exactly how a Future Bass track is made. Not only did we break down the inner workings into Stems, MIDI/WAV loops, and Presets, we also threw in our complete Ableton Project file. Load up this template and see every instrument, effect, setting, and mixing technique that we used, even our master tracks. Use this template to learn, dissect, customize and create your own Future Bass masterpiece. Brazilian Bass South brings you a chance to see how the professionals create a booming Brazilian Bass track. This template comes with amazing resources and elements such as our FL Studio Project File that gives you a detailed look at the arrangement and overall design of the track, the audio samples we used, our automation clips and presets. With our organized template and a positive work flow, just load up and you are ready to go. Get ready to explore the fundamentals of Hybrid Trap. With the Logic Pro Project File, you can view our arrangement, what effects we used on our instruments, how we did our mix down and how we mastered the track. Allow our template to inspire you, to build upon, or design your own Hybrid Trap mix. This template was designed to make you a better Trap and EDM music producer and to have fun while doing it. Great value: Huge collection of construction kits, samples, midi files and presets. Plus three plugins. Over 8GB!